As a result, I knew that this guest post had to involve ice cream. I’ve made a few baked alaskas over the years but I’ve never nailed down a recipe I loved. This post seemed like a good time to finally sort it out. So, to make my idea of a perfect baked alaska, you start (funnily enough) with ice cream. I love David’s rich vanilla from The Perfect Scoop. Instead of including it in the recipe and making it seem insanely long, it’s probably easiest if you have a look at the recipe here. You can, of course, buy some high-quality ice cream and use that instead. The next thing I think you need is a layer that’s fairly tart or sharp. The ice cream, cake and meringue are all fairly sweet, so it needs something to act as a contrast. 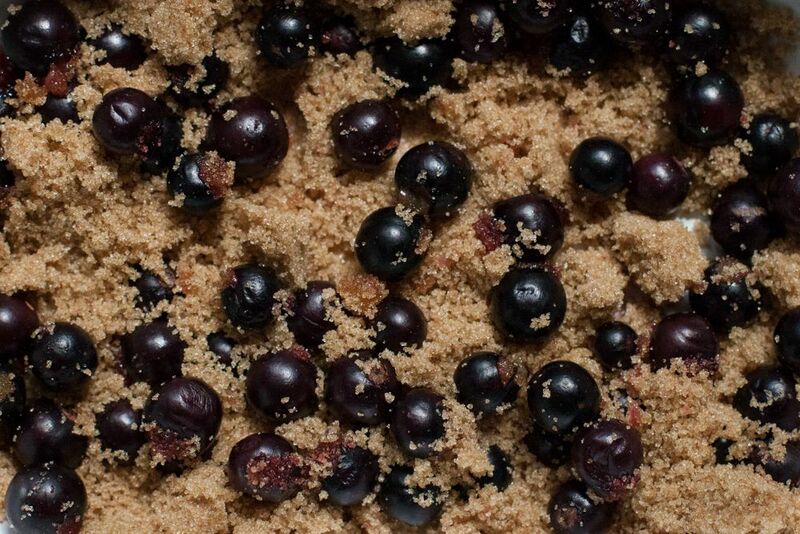 My current favourite is roasted blackcurrants. I toss them with plently of brown sugar (they’re very, very tart) then roast them until they turn into a jammy compote that’s beginning to caramelise around the edges. You could also use another fruit and significantly reduce the amount of sugar – blackberries would be a good autumnal choice, maybe combined with a bit of cooking apple. After that, cake. I use a simple all-in-one sponge that’s lovely and fluffy. It can then be cut up and shaped. Though it means you have to be quick with the meringue, I think it’s important that the cake and fruity filling are room temperature, not frozen, when they go into the oven. Semi-frozen sponge isn’t nice. Finally, you need the meringue. I use a simple French meringue, but I think Swiss meringue – perhaps with some brown sugar – would also be great. 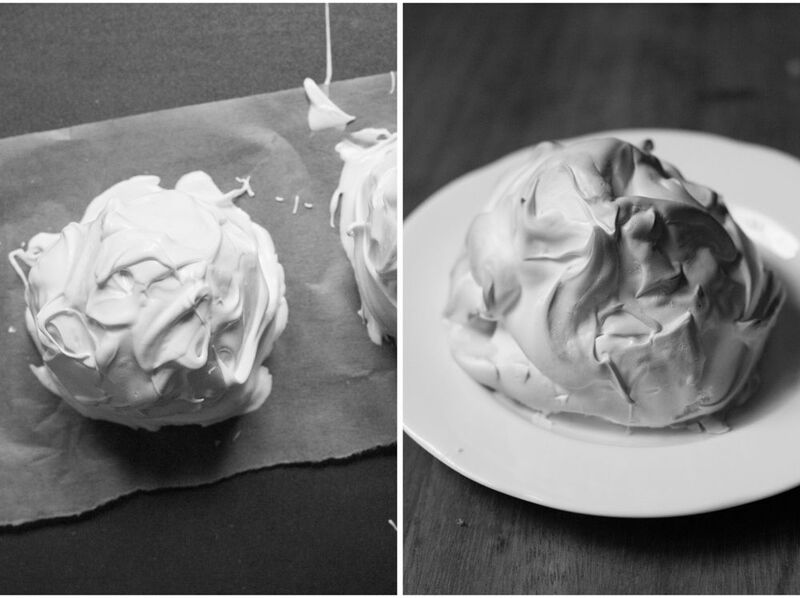 I’ve just written two guides on meringue – one on the basics and French, the other on Swiss and Italian – so if you’re nervous about making it, do check them out. By combining these four elements, you get an addictive range of textures, temperatures and flavours. Though I usually make one big baked alaska, I decided to try making individual portions for this post. I used a tiny circle of cake, a single scoop of ice cream and a spoon of blackcurrant. When assembled, however, they looked enormous… (it’s worth noting that the plate I was using is only 16cm across, so this concept is reinforced by a bit of an optical illusion). I didn’t bake up all four at once because I didn’t have enough people to eat them. You could make one big one (use a small bowl or teacup lined with cling film to mould the ice cream then cut the cake to match, this is also easier when it comes to quickly applying the meringue). Or you could make ones this size. Then share… or not. Preheat the oven to 170C/340F. Tear four big squares of cling film. Scoop a ball of ice cream, making sure it is compact. Flatten the sphere a bit on one side (so it will sit on top of the cake) then wrap in cling film and place in the freezer to harden up (it’s important that they’re nice and solid to give you time to get the meringue on top). Take the stalks and brown ends off the blackcurrants. Toss them with the sugar in a small ovenproof dish. Bake for 20 minutes, giving them a stir once if the sugar hasn’t incorporated into the juices. Leave to cool – it should thicken up to a jam-like consistency. Butter and line a 7″/18cm sandwich tin. Make sure the butter is nice and soft, then place all of the cake ingredients into the bowl of a stand mixer (or a mixing bowl if making with an electric hand whisk) and whisk until fully combined. Check that the mixture drops off a spoon/spatula after a slight moment of hesitation. If not, add a dash of milk. Transfer to the tin and level out – there isn’t much mix, don’t worry. Bake for 15-20 minutes until golden brown and a toothpick can be removed cleanly from the middle. Leave for a few minutes then turn out of the tin onto a wire rack. When you’re nearly ready to serve, turn the oven up to 220C/430F. Trim the cake if it has risen a lot – you don’t want it too thick – and cut into four circles of about 2.5″/6cm. 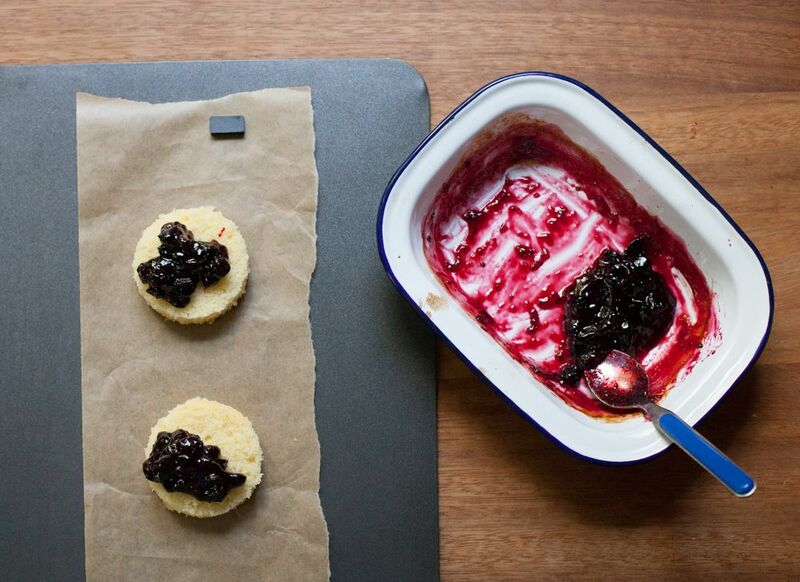 Spread 1/4 of the blackcurrant mixture on each of the cake circles and place on a lined baking tray. Pour the egg whites into a very clean bowl and have the sugar to hand. Whisk until the bubbles have become tiny and you have soft peaks, then slowly add the sugar. Whisk until you have peaks that are relatively stiff but still curl over. Add the vanilla and briefly whisk through. Remove one of the ice cream balls from the fridge and place it on the cake. Quickly spoon meringue on top and spread it all over – there must not be any gaps and it needs to be relatively thick (at least 1 cm). Quickly repeat for the others. Place in the oven and bake for 3-4 minutes until the meringue has turned golden then serve immediately (you can also blast them with a blow torch if you have one). This is gorgeous Emma! I love the idea of those tart blackcurrants – such a lovely contrast to the meringue and sponge layers. This looks very very good. I haven’t had baked alaska in years but this might just prompt me to make it for my children! I’m inspired to try my hand at baked Alaska now! Lovely guest post Emma. I stumbled upon your blog a few months ago and have been an avid reader ever since. Love the sound of these Emma! Last night I was watching the GBBO Floating Island task and thinking to myself how I couldn’t eat a bowl of sweet custard and sweet, soft meringue without some sort of contrast in texture and with no sharpness/tartness from fruit. So here we have it, the perfect dessert! 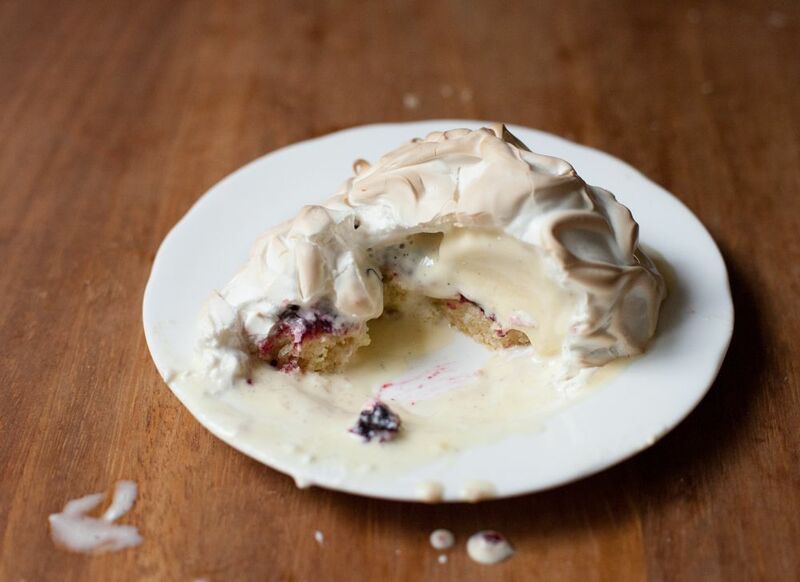 I’ve never actually had baked alaska – just didn’t seem to entice, but now I think I might actually have a go! Congratulations on your wedding – and have fun on your honeymoon! I love ice cream too and find it hard to say no to baked alaska. Great guest post! Tart currants go so well with any type of meringue dessert, but I think this is the most inspired version of the combination that I’ve seen. Lovely post! What a gorgeous treat! The last time I had baked Alaska (and I think the only time – poor deprived me) I shared one with my Mum when she took me out for a special lunch when I got accepted into university. I really need to need to fix that! Love the black currants you’ve used here too. I don’t think I’ve ever come across black currants at the markets here in Australia sadly. Deliciously tempting, Emma. 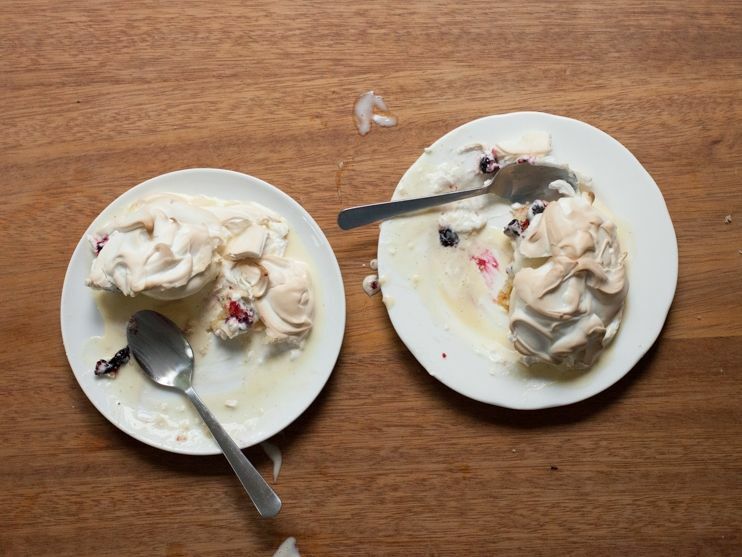 I’ve never actually eaten baked alaska before but I am a sucker for meringue, ice cream and tartiness, so it’s a no-brainer really! Lovely to see you over here at the Little Loaf. And Kate, congratulations and hope you’re having an amazing time! Great to see Emma guest posting here. I never made baked alaska. There was a very popular old dessert made of a swiss roll, filled with ice cream and covered in meringue, which was then baked in an oven for much longer than you’d expect ice cream to hold. This version sounds much more interesting, especially with blackcurrants!